The Baby Quasar Red fights signs of anti-ageing. I have been using the Baby Quasar Red for more than 5 weeks now and am very happy to let you guys know how much it has benefitted my skin. But first, an introduction to the product. The Baby Quasar Red is an LED instrument that you can use at home as part of your skincare routine. It uses specific wavelengths of natural red and infrared light energy to restore the skin’s normal activity and tackles several signs on ageing. The Baby Quasar comes with a cord and wall mount power unit for you to connect it to the mains. It does not contain a battery and needs not be charged prior to usage. Initially, it should be used once every 48 hours in the first 6 weeks. After that, it can be used once or twice a week for maintenance. 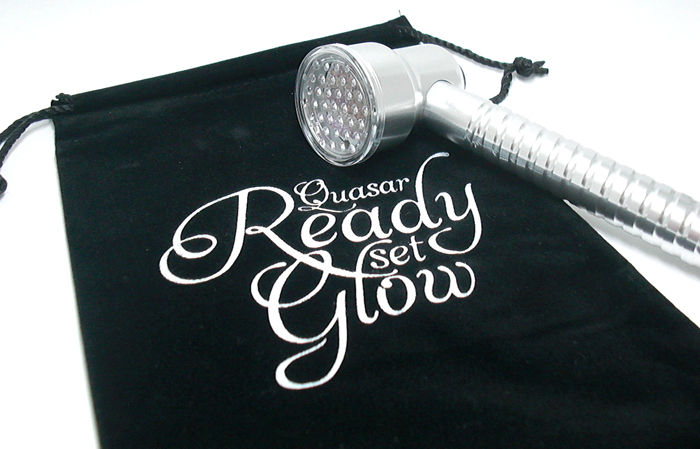 To use the Baby Quasar, you have to ensure that your face is clean of makeup and dirt. You can first apply your skincare items, such as your serum and moisturiser, before treatment with the Baby Quasar or simply use it on a completely bare face. Then, divide your face into 6 sections (illustrated in the manual that comes with the Baby Quasar) and, using one of the 3 modes of the instrument, move the wand slowly in circular motion over each section for 2 minutes. Do all 6 sections twice; It will take 24 minutes for this. The cute pouch to store my Baby Quasar in. Each Baby Quasar comes with a 5-year warranty. The red switch changes the mode. The small circle on the left is the indicator light that changes color according to the mode used. 1) Continuous Wave – Green light on indicator, 4 minute buzzer, strongest mode of all. 2) Low Frequency – Orange light on indicator, 2 minute buzzer, for sensitive skin. 3) High Frequency – Red light on indicator, 2 minute buzzer, for normal skin. Although you’re supposed to use the High Frequency mode for the second round of each treatment, I use the Low Frequency one for both rounds. This is because I found that using the High Frequency mode results in redness on my skin and some capillary veins become more obvious. I don’t use the Continuous Wave mode on my face at all as it is the strongest mode, and is meant for healing and pain control. 1) Reduce fine lines and wrinkles. 5) Increase oxygenation and restoration of the skin’s natural cellular activity, which keeps skin renewed and fresh. 6) Increase lymphatic system drainage, which detoxifies the skin tissue. 7) Soften scarring and rough texture. 8) Smooth out uneven pigmentation. 9) Thicken and firm skin. 11) Promote a healthy look. Now that’s a pretty long list of benefits for such a small product. Although my pores still look the same (equally attention-seeking as before), my skin has definitely become more radiant! Scars from old and more recent acne breakouts, as well as pigmentation patches, have definitely lightened by many times; This is the most significant change since I started using the Baby Quasar. The redness in my very sensitive skin has faded and I attribute this to the increase in circulation. I can’t say much about fine lines and wrinkles because I didn’t really have them in the first place. My skin does feel more toned, supple and healthier and it doesn’t flush as easily as before. The best part about this is that effects, even if only slightly, could be seen immediately after each treatment! I am not exaggerating. This was especially true for the first few sessions, when there was more stuff to clear up. The good part about this product is that it doesn’t contain any chemicals, so I will definitely not have allergies to it. It’s also pain-free and has no downtime, meaning you can go about your daily activities, such as putting on makeup or going swimming, right after you use it. I use it with my Clinique Even Better Clinical Dark Spot Corrector serum and Clinique Dramatically Different Moisturizing Gel. I recommend doing the same with your own serum because the Baby Quasar aids in absorption of your skincare products. The bad part of this product is the expensive price! For those of you in Singapore, you can check it out on Skin Street, a local online store where it’s sold. Skin Street also sells the Baby Quasar Blue, which is meant for targeting pimples. Another disadvantage to some people could also be the time it takes for each session. For me though, one hour a week is not too much to spend on skincare. My skin is not completely flawless after using the product for several weeks but its condition, especially the symptoms of rosacea, has improved tremendously. The Baby Quasar Red is a great alternative to regular visits to the spa for LED light treatments. You can use it whenever you prefer (of course observing the 48 hour rule) and you don’t even have to dress up for it. I generally use this right before bed, when my skin is already thoroughly cleansed, moisturised and ready for a good night’s rest. It’s now a staple on my bedside table, together with some of my other skincare items like lip balms, body oils and moisturisers and to be honest, I don’t see how this is going to change anytime soon. Review: Baby Quasar Red was last modified: February 29th, 2012 by Roxanne C.